My wash machine drain slows to a crawl at least once every year. I usually pay a plumber about $100 every year to snake the drain clear of the buildup. This year I decided to give this tool a try. The Clog Hog tool matched the PSI, GPM output and hose connection of my pressure washer perfectly. The tool entered the drain with very little effort and managed to extend the entire 50ft of the hose length. As a bonus I proactively cleared my bath and kitchen drains with ease. This tool has already paid for itself. I just jetted most of my drain lines with the Clog Hog. It worked flawlessly, even in the 1.5 inch drains. Well worth the money and high quality. Hose made from good quality material and was able to snake it through 1 1/2 pipe leading to exterior dry well. Had an issue with nozzle clogging but I suspect my well water sediment contributed to that. So far I am happy with the results. My dry well previously clogged by washer machine lint. I installed a washer machine lint filter in my home to prevent future build up. Excellent Product... Just as the Ad... simple and Easy to use..... and the best it performs es it says ...!!!! I use it to clean my sewer lines. Works great with a standard pressure washer. We unclogged all of our septic leach field pipes that were clogged with small palm tree roots. Followed the instructional video online. Very pleased with the results! Very powerful, durable, operates as described, good value. The Clog Hog really works. After spending a considerable amount of time and effort with a sewer snake, we tried the Clog Hog. It cleared not only the clog, but also pushed out quite a bit of build up. We had one clog on a rental house where we were looking at busting the slab to get to the clog. The Clog Hog cleared it. 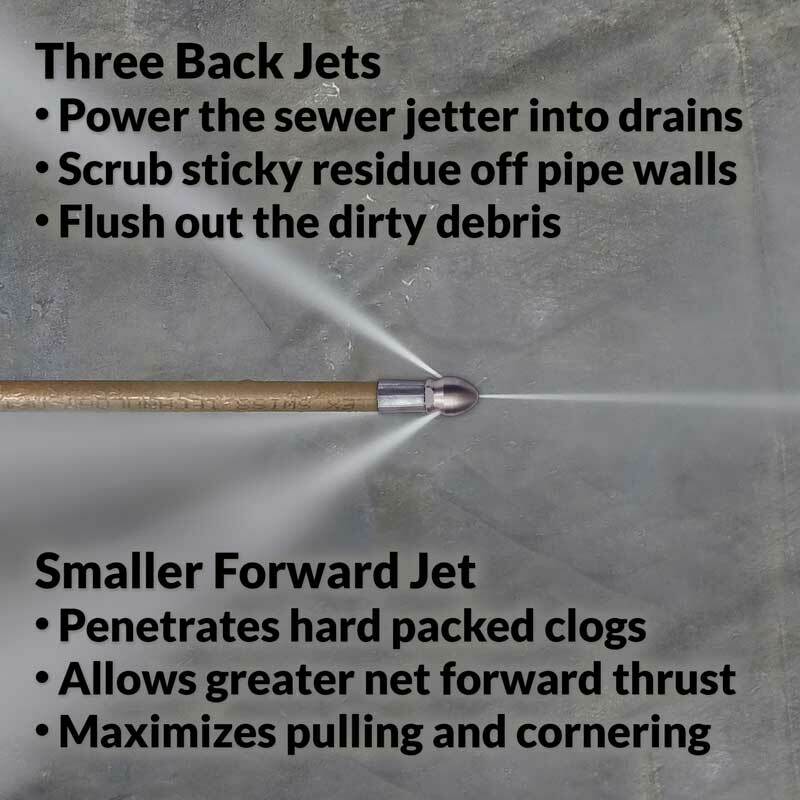 Purchased this tool after getting a quote from my plumber on how much they charge to Jet clean my drain. Figured if it worked it would more than pay for itself in one use. The first time I used it it seemed to blow out the clog pretty quickly and the drains seemed to work fine. However my drain clogged up again in 2 days. I decided to try it again but this time I ran the hose as far as it would go in then I ran the hose up and down the pipe several times to really give it a chance for it to work and clean out the drain. This time it worked like a champ, it cleared the pipe completely. 2 months later my pipes are still flowing freely. I highly recommend this product it does exactly what it says it does. I just recommend running the tool up and down your pipes several times to really clear it. I'm very happy with this purchase. Unfortunately it didn't do what I needed it to. At anything more than 2-3 feet the hose was too flimsy to further down the line where the elbows were. Also it always got stuck in the bathtub trap, all in all I had to cut the pipes out and do it the hard way. Regardless though the clog was at the cast iron main and it wasn't able to punch through that anyway. The residential hose is probably better off for simple stuff but nothing that requires you to snake it at any distance. Jake, thank you for your review. 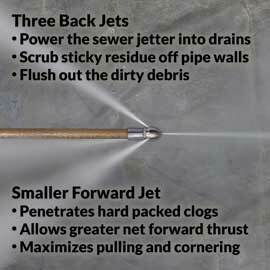 It's usually impossible to pass a sewer jetter directly through the drain opening at the bottom of a bathtub. As noted on our How Do I Unclog a Bathtub tips page, you'd need to carefully remove the overflow plate, taking care not to damage any attached stopper and linkage as you pull them out, and then feed the drain cleaner through the exposed drain opening behind. 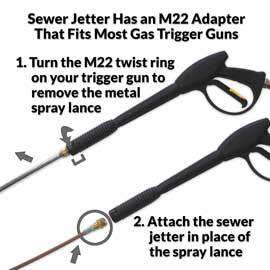 Because older bathtub linkages can sometimes be difficult to remove and reassemble, it's often much easier to insert the sewer jetter into a different clogged drain opening in the same bathroom, such as the opening under the sink that's exposed when you remove the trap. If the bathroom has a separate tiled shower that's also clogged, removing the shower drain cover and feeding the drain cleaner through that opening is often the easiest approach since there's a minimum of preparation and cleanup needed when feeding the sewer jetter into a tiled shower floor drain. Please contact us if you'd like further suggestions to help you complete this project. Nozzle is a lot smaller then the one that I got off Amazon. The product is more expensive but I needed it to clear 90°. Only used It Twice So Far, But Each Time It Worked Like A Champ!! Would Recommend This To Any Body Who Has A stopped Up Line!!!!! For almost 18 years (since I've lived here) the washing machine (draining the water) would cause the basement floor drain to gurgle. Recently the drain was also backing up. I've had plumbers come in and charge anywhere from $150 to $300 to snake the line, with no significant change. 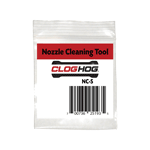 I finally decided to buy Clog Hog needle nose after looking at some slighly cheaper options online due to the great reviews, compared to mixed reviews on cheaper jetters. I am not able to access a cleanout so I opted for the needle nose to allow me to get through a a couple 90 degree turns under the sink and into the drain line. I was able to get the Clog Hog to pull itself through the line and spent 20+ mins jetting the line. Filled the washer with water, ran it, and NO BACKUP and NO GURGLE! 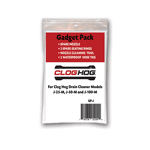 The Clog Hog is able to blast away the black buildup of gunk in the lines in a way that the metal snake just can't do. Great product! My 50 ft. needle nose drain cleaner, is a fantastic drain cleaner. It works great cleaning out my gutter and sump pump drains. It has made life so much easier at my home, I don't know how I survived this long without it. Worked Great! Money well spent! For the past 5-6 yrs, our kitchen sink kept clogging. Tried the 25 ft snake, didn't work too well, then I found those pipe bladder thing and that worked -- for a short while before it clogs up again. 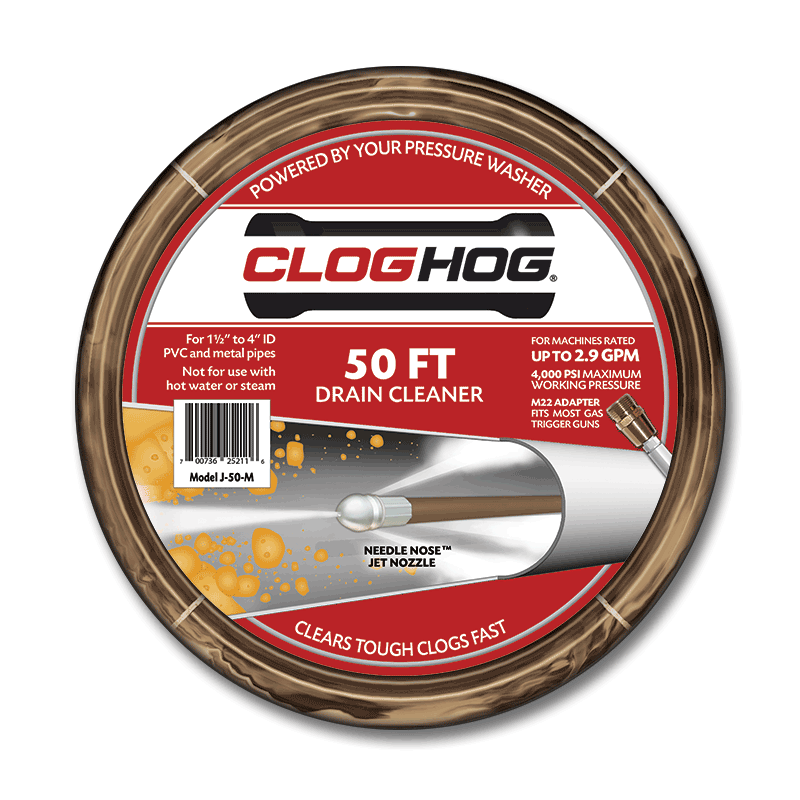 I've been looking into getting the Clog Hog for several years, but never did because I didn't have a pressure washer. Well, I've finally broke down and got a pressure washer (Champion 3200 PSI / 2.4 GPM) and ordered a 50 ft Need Nose (would have ordered a 100 ft, but didn't see it for a 3000+ psi pressure washer). I started at the clean out right outside the kitchen sink. Went down about 3-5 ft before it got stuck. I worked the Clog Hog in an out several times before it started going in a bit more easily. I repeated this in and out process every few ft. Once I hit about 20-25 ft or so, I really got stuck. It wouldn't go in anymore. I thought I hit a corner, so I tried twisting the hose and see if it can turn itself, no go. Well, I kept at it for about 5 to maybe 10 min and it finally broke through. From that point on (I stopped at around 40 ft) it was free flowing. I didn't time myself, but I'm getting it took 15-30 min. During the entire process, chunks of what looks like plaster came out. Some so big that I couldn't remove it while breaking it up. The last bit (the area I spent the most time on) produced the biggest piece. Anyway, I plan on using it every six months or so for maintenance. Money well spent. Highly recommended! I've tried many things to unclog my drain nothing worked. Had Roto-Rooter, he broke off a tool in my drain. He got a pin hole open it was slow draining. Used cloghog, drain was completely blocked.It opened my drain and the stuff that came out was unbelievable. Broke up hardened something and flushed it out. My drain is clear and fast running. I recommend this product and I have told others if they have a drain problem get one of these. This is a great product. After trying several different chemical products without success, we decided to purchase the Needle nose drain cleaner. There was so much grease build-up that we had grease coming back through the sink. After running the Needle nose, the drain pipe is clean and we haven't had any more problems. Best tools for the job! The ClogHog works like a dream!! The downspouts for our house and drains for the backyard Patio all feed into the same underground drain. Needless to say the drain ended up getting clogged. After first showing my wife the Clog Hog website she insisted I call a plumber first. So after spending $527.00 (you know, happy wife, happy life) and still having clogged drains I insisted on purchasing a Clog Hog. We have a floor drain in our house that has been an issue since we moved in more than 12 years ago. 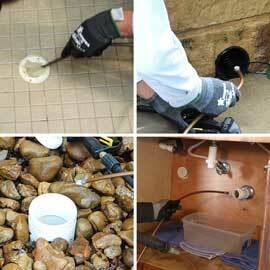 I've spent more than $1,500 over the years to have the drain cleaned periodically by plumbing services. No more. 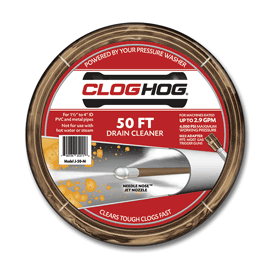 My wife found Clog Hog on-line and ordered the 50 ft needle nose. It was easy to use and it really does work! My clog was 40 feet into my drain. I highly recommend. I had a kitchen drain clog that the standard drain snake could not keep clear. I purchased a pressure washer and the Clog Hog 50 Ft Needle Nose Drain Cleaner and it worked phenomenally! The amount of crud that came out of the clean out was absolutely disgusting. The Clog Hog was easy to use and did exactly as advertised. I have recommended the Clog Hog to several of my friends already. 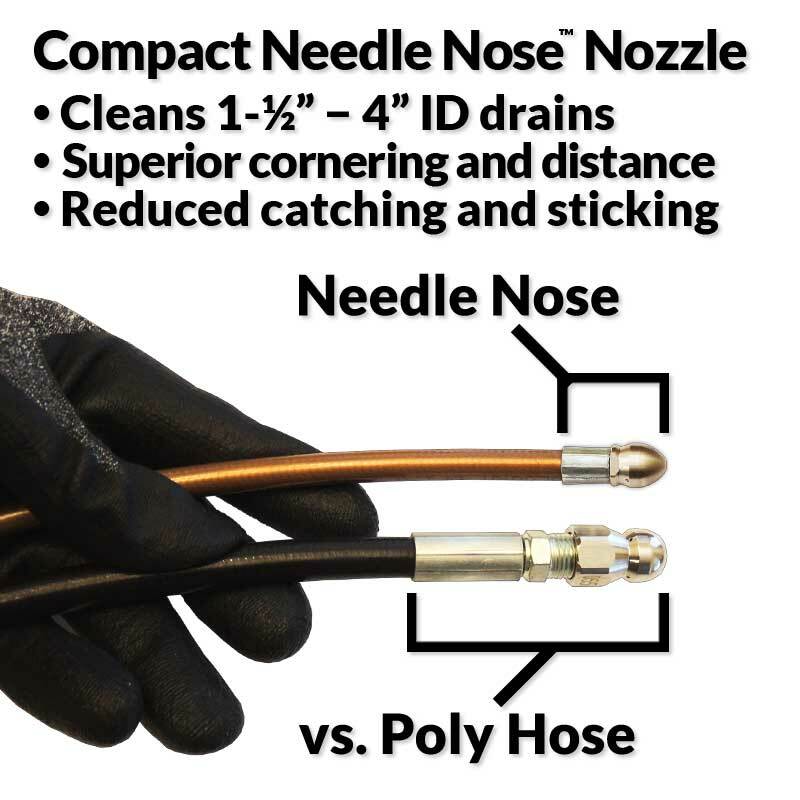 Purchasing the pressure washer and Clog Hog Needle Nose Drain Cleaner was about the same cost of having a drain specialist come out and snake the drain. After one use this setup has paid for itself. I highly recommend the Clog Hog. It works, and works well !!! Mike, thank you for your comments. 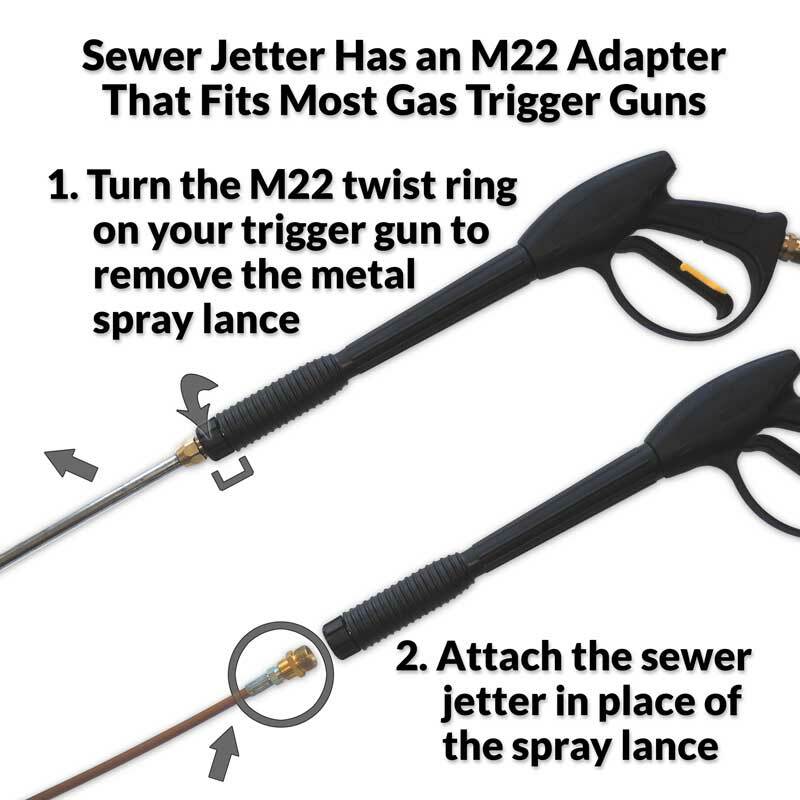 We recommend that you do not pass any drain snake or sewer jetter - except for a specially designed toilet auger that has a protective plastic sleeve - through a toilet because the drain cleaner could scratch the visible ceramic surface at the bottom of the bowl. Fortunately you can often access the same bathroom lateral line, without removing the toilet, by inserting the Needle Nose Drain Cleaner through a different drain opening such as the opening under a bathroom sink (after you remove the P trap) or a shower floor drain. Was having problems with main sewer line for years. Rented sewer augers for under the sink and large drain cleaners, which we took up on the roof...yes, the roof!! Never got all the crud out. 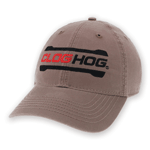 Researched online and found the Clog Hog. Read about it and called customer service. 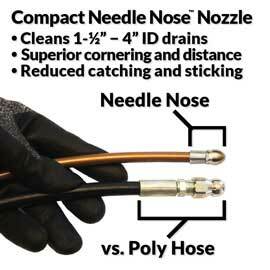 Spoke with them over a few days and they helped me figure out which size needle nose and length of hose I needed. I highly recommend you research what size drain you have and hopefully know where the pipe bends, and how many feet until you reach your problem area and also know what model and pressure your pressure washer is. All this info helps customer service determine which drain cleaner and length of hose you need so as not to waste your money. The company was very helpful in making sure I didn't pay for more than I really needed. 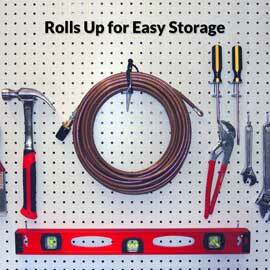 I ended up also buying a 30' replacement extension hose for the wand at Sears. This was so I could get on my roof with the pressure washer wand and the Clog Hog, while my wife stayed on the ground to turn the pressure washer on. I went down the sewer pipe on the roof and let the Clog Hog do its thing. Worked like a charm! That little needle nose drain cleaner did a fantastic job, very powerful! I recommend you read about the product and watch the video this company has made so you know what to expect. 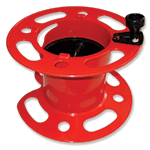 I highly recommend this product to anyone who has ever had a sewer drain problem. This thing is great blasted out my drains and saves me about 800 bucks. Plus now if it happens again to anyone I know I can help them out too. Was less messy then expected too. One of the very few things I have ever purchased that works absolutely better than advertised. The 50 needle nose drain cleaner, on my first attempt, completely cleared a 40' lawn drain in lest than 3 minutes. The drain was totally clogged with oak leaves and various yard material.